today I will share a little bit more about the main engine. Two weeks ago I wrote that the engine is build over three levels. 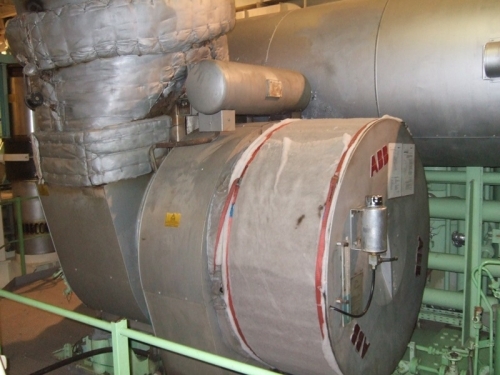 I took some photos to prove it, as well I will give you some facts about the engine itself. So, its quite a bit noisy if this engine starts working. I am impressed! And, compared with the purifier I was writing from the other day you can watch the revolutions of this engine without throwing up! The consumption is not so bad, isn’t it? How long it takes you to consume with your car 40000 litres diesel or gasoil? For sure longer than one day! Christoph: Fred was very impressed, but to be honest there are much larger engines around with up to 80000kW output and a fuel consumption of 250000 liters per day. 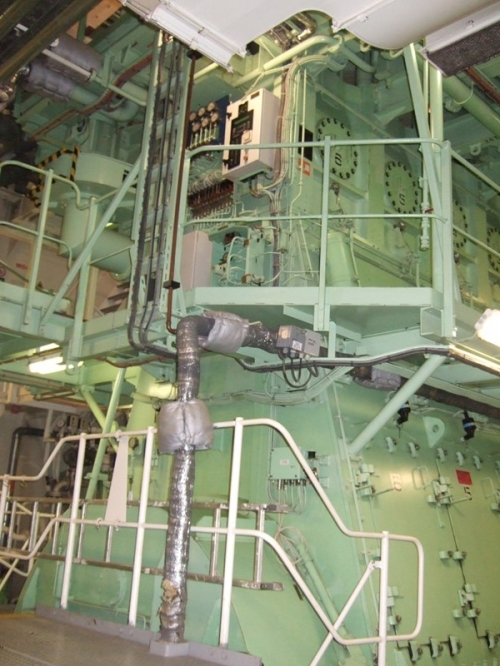 So the main engine of the Gaschem Adriatic is rather a “small” one! 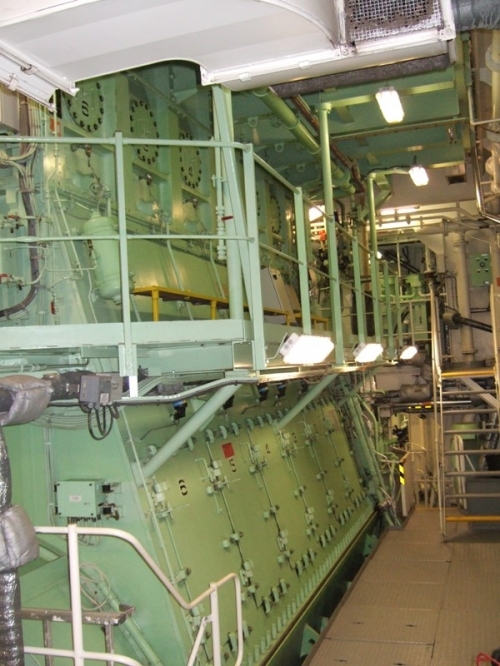 Never mind how huge the main engine on board a ship is – all have an local emergency stand. From there the engine can be operated manually. You can see me how I test several buttons and get familiar with them. Once a month the engine is tested from this local control station so that the engineers get a feeling and familiar in operating it from this position. Such a big motor need a lot of air to function properly. Here I took a picture of the turbocharger for you. He ensures that the engine will not suffocate and stop working without air! 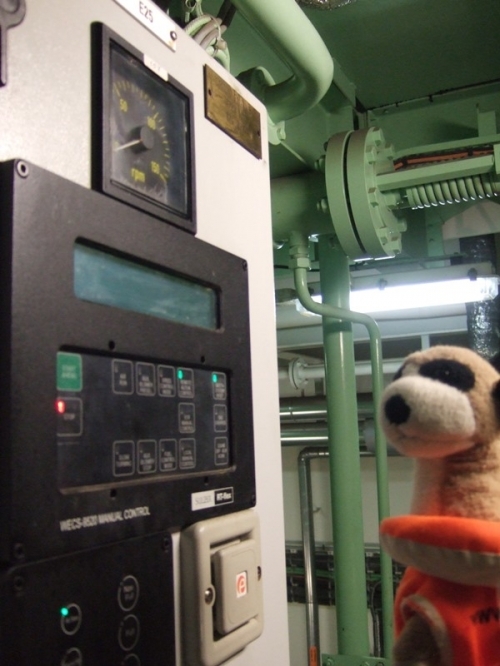 I had a further look around in the engine room. 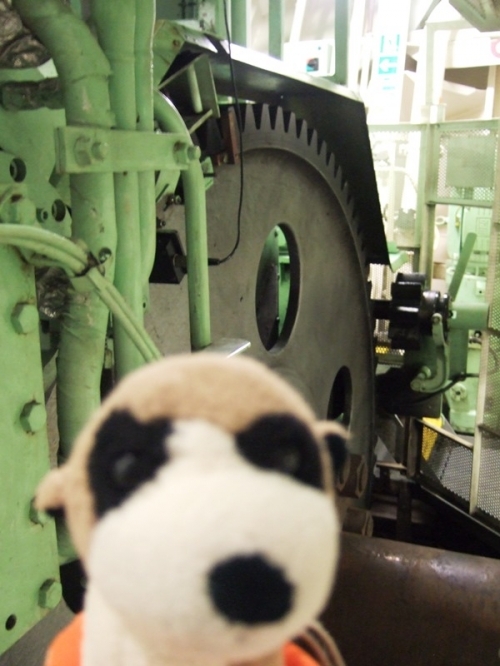 Here I sit on the guard for the propeller shaft which connects the main engine with the propeller. I also discovered a lot of pumps. Looks like a “parade” how the pumps are arranged. 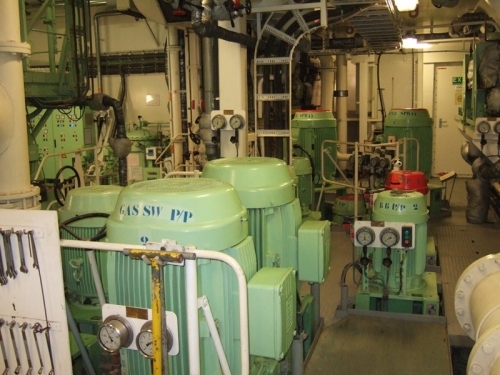 I counted 13 sea water pumps for different purposes on board the Gaschem Adriatic. Wow! Most of them you can see in the next picture. 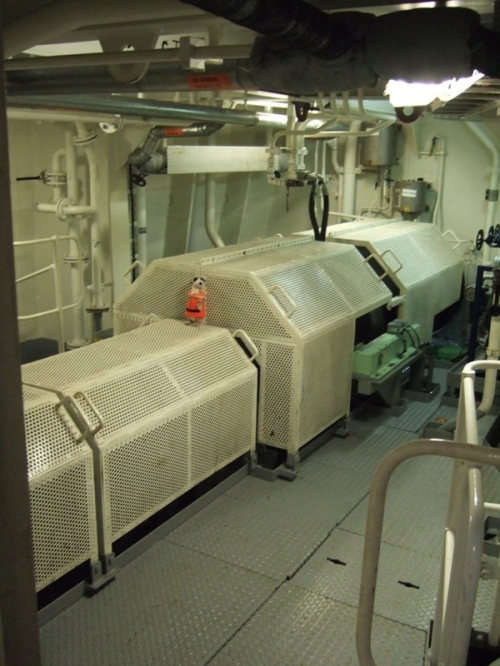 Much more is to discover in the engine room. What other equipment and machinery I found I will share with you next time! Christoph and I have been in Australia „ashore“. Unfortunately we could not take a picture (on gas terminals and on deck of gas carriers it is not allowed to take pictures, use a mobile phone, smoke etc. due to the danger of an explosion). We actually just made it down the gangway onto the pier and back. Why? 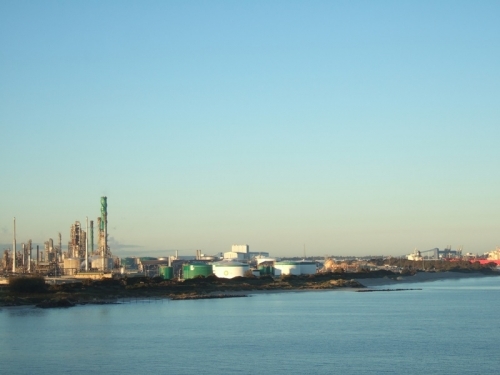 We stayed just 18 hours for loading butane in Kwinana, Australia. But at least Christoph can say know: “J was there and had my feet on this continent!”.